A complete set of three monocultivar oils from award-winning producer, Frantoio Pruneti: Leccino, Moraiolo, and Frantoio. 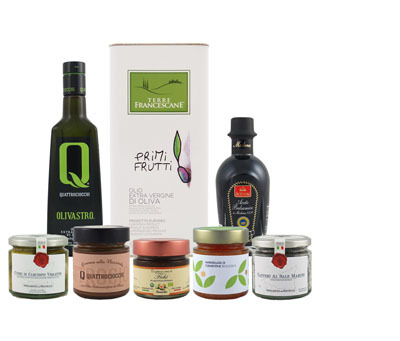 All oils are pressed from organically farmed olives grown in the renowned Chianti Classico region of Tuscany. The collection is a wonderful way to compare and appreciate the differences between the most typical varieties of the Chianti region, while offering several tips for matching each oil with different dishes. LECCINO: A light intensity oil, balanced in both bitter and spiciness, though not aggressive, with aromas of grass, fresh vegetables and green apple, with a simple white pepper finish. MORAIOLO: An oil of strong intensity and spicy sensations with aromas of almond, nuts, oregano, and dried fig, with a powerful black pepper finish. FRANTOIO: An oil of strong intensity with notes of artichoke, arugula, green almond and cucumber, with a green pepper and rosemary finish.